Pretty candle holders in Fine Stone Textured Finish and decorated with pine garland look like Mother Nature had a hand in the decorating. A 6-Pack of Candlelight was designed by Patty Schaffer. Learn how to create simple seasonal works of art by exploring more Winter spray paint projects from Krylon®. Following surface prep instruction on the spray paint can, thoroughly clean and dry bottles, removing all traces of grease, oil and other residue. Let dry thoroughly. Apply a light coat of White Primer to the bottles. Repeat until bottles are completely covered, allowing time to dry in between coats. Spray a light coat of Olivine Fine Stone Textured Finish on the bottles. Repeat until the bottles are completely covered, allowing time to dry in between coats. 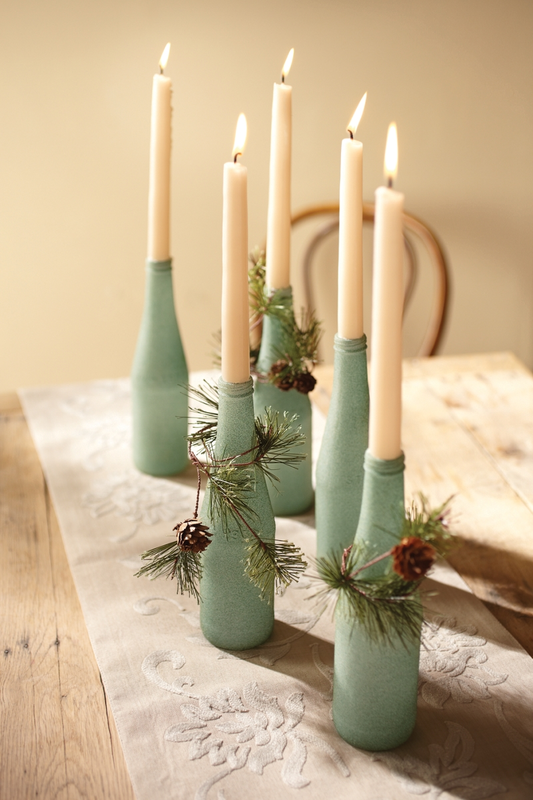 Cut a section from the artificial green garland with pinecones and wrap it around a bottle neck. Let some of the section hang down. Repeat for each bottle. Tie red ribbon around the necks of two of the bottles. Make two tags out of kraft cardstock and embellish them with sections cut from a vintage Christmas card. Ink the edges of the tags with brown ink. Attach the tags to the red ribbons. Add white taper candles to the bottle openings.